The East Neuk Festival has just completed another successful year staging events and bringing wonderful music and more to our corner of Fife. 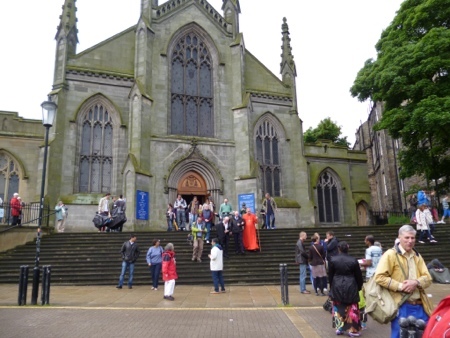 This article in The Scotsman prompted a search for information about the Pilgrimage Walks which are mentioned, and in particular the one which was starting on Sunday 1 July 2012 from St Mary’s Cathedral in Edinburgh. A friend from the Lammermuir Festival was setting off on a pilgrimage of his own, sailing from North Berwick to Cellardyke to reach the East Neuk Festival’s closing concert. 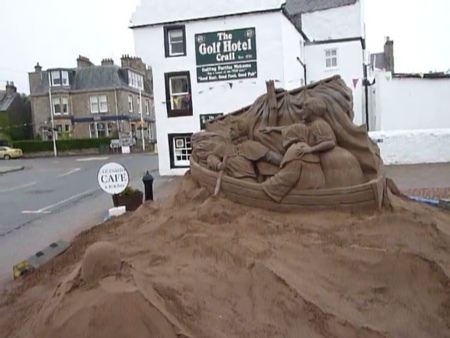 And in Crail, Graham and Edna of The Honeypot were being cast as Pilgrims in the East Neuk Festival sand sculpture. If you’ve wondered (as I have) why there’s a street in Crail called Arrighi Crescent, I think I have found the answer in this blog post.